SANTA ANA, Calif. -- An off-duty firefighter who came to the rescue of two victims of a small plane crash on the 405 Freeway is speaking out, CBS Los Angeles reports. 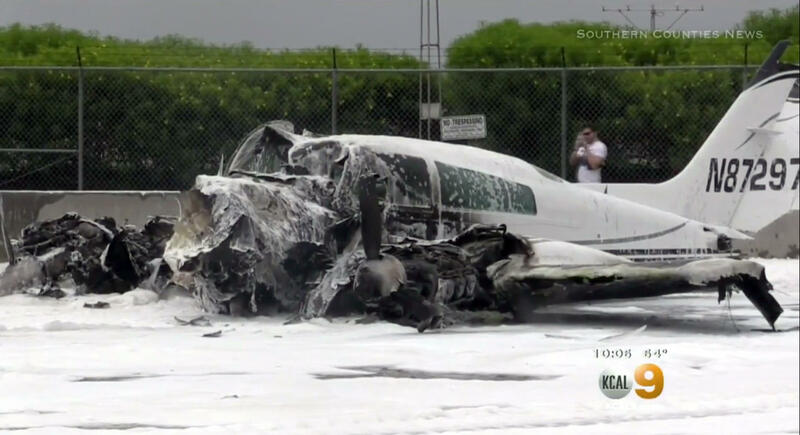 John Meffert was driving home from his shift at the Avalon fire station at 9:30 a.m. Friday and watched as fire engulfed the small plane as it came down just short of the runway at John Wayne Airport in Santa Ana. He initially decided, for his own safety, to stay back. But then he saw something that made him run toward the flames. "I'm on the phone with my dad," he said. "I kind of told him, there's a plane really low. I think it's going to hit me." Meffert said the wing of the plane clipped the front of his hood. When he saw one of the victims moving, he rushed toward the scene. "The wife that was the passenger -- by seeing her face and head pop up out of the passenger side -- if she could be there, I thought, I could be there," he said. Meffert dragged the woman out of the plane. That's when an off-duty nurse and nurse practitioner abandoned their cars and ran to help her. Meffert then went back for the pilot. "With the pain he was having in his back, I dragged him off to the side," he said. Meffert stayed with the pilot and his wife until help arrived. "I wasn't looking for any fame," he said, adding, "The fire service -- we're always here just to help people." The pilot and his wife were in stable condition Friday night. A hospital spokesperson said one of the patients did suffer internal bleeding and was being closely monitored.